Turkey's President Recep Tayyip Erdogan addresses his ruling party members in Ankara, Turkey, Jan. 26, 2018. A defiant Turkish President Recep Tayyip Erdogan warned Friday that he’s prepared to risk confrontation with the United States over Turkey’s military incursion into northern Syria, vowing to next target a Kurdish-held town where U.S. Special Forces are stationed. Speaking to members of his ruling Justice and Development Party (AKP) in Ankara, a belligerent Erdogan shrugged off U.S. calls for Turkey to limit the incursion launched a week ago, saying the next town to be targeted after the Kurdish enclave of Afrin, where Turkish tanks have been grinding through winter mud, will be Manbij, raising the possibility of American troops being drawn inadvertently into the bruising fight between Turks and Syrian Kurds. 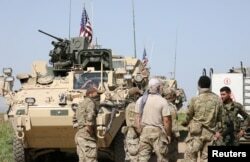 The Reuters news agency reports that Turkish Foreign Minister Mevlut Cavusoglu said Saturday the United States needs to withdraw from northern Syria's Manbij region immediately, suggesting that an attack might be imminent. But speaking to AKP members, Erdogan outlined a far more expansive operation than he’s committed to before, indicating his readiness to order Turkish forces, along with thousands of allied Syrian rebels, remnants of the Free Syrian Army that led the fight against Syrian President Bashar al-Assad, to drive right across northern Syria all the way to Iraq. FILE - U.S. forces take up positions on the outskirts of the Syrian town of Manbij, March 7, 2017. That would mean attacking east of the Euphrates River the Kurdish stronghold of Rojava, which Syrian Kurds hope one day will become their own independent state. It would mark a dramatic escalation of Turkey’s offensive - as well as adding a massive complication in the already complex Syrian conflict. “We will rid Manbij of terrorists, as was promised before. Our battles will continue until no terrorist is left right up to our border with Iraq,” Erdogan said. Turkish officials refer to Kurdish militiamen with the People’s Protection Units (YPG) as a terrorists. They say the YPG is an affiliate of the Turkey’s own outlawed Kurdish separatist group, the Kurdistan Workers’ Party (PKK), which has waged a three-decade-long insurgency against Ankara. The Turkish offensive, oddly named Operation Olive Branch, “will continue until it reaches its goals,” Erdogan pledged. He made no reference to the fact that as many as 2,000 U.S. troops are stationed in Manbij or nearby. We will “walk on our road until the end,” Erdogan added. Turkey shares a 911-kilometer-long border with Syria, around two-thirds of which is under YPG control. Manbij is some 100 km east of the mountainous pocket of Afrin, which has been the focus of the Turkish offensive so far. 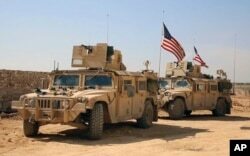 U.S. troops have been located in Manbij since 2016, when Islamic State militants were driven from the city by the YPG with American assistance. Kurdish officials say they are ready to deploy militiamen from Rojava to reinforce about 10,000 YPG fighters in the crowded city of Afrin, which would mean weapons, including anti-tank missiles, supplied by Washington for use against jihadist militants being turned instead on the Turks and their Syrian rebel allies. 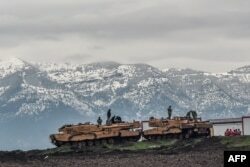 FILE - Turkish tanks are parked near the Syrian border at Hassa, in Hatay province, Jan. 24, 2018, as part of the "Operation Olive Branch." On Monday, U.S. Secretary of State Rex Tillerson said Washington would continue to pursue talks with Turkey and hoped to find a way to create a “security zone” that would meet Turkey’s “legitimate” security interests.” Senior Pentagon officials visited Ankara this week and sought to try establish a clear line between Afrin and other Kurdish-held territory and between different YPG units. Major Adrian Rankine-Galloway, a Pentagon spokesman, told reporters that “the armed Kurdish groups in Afrin” are not part of the U.S.-backed coalition against Islamic State. But some analysts say that distinction is false, and former U.S. envoy to Turkey James Jeffrey says there is “confusion and conflict” in Washington about what steps to take. Syrian Kurds have accused both the U.S. and Russia of stepping aside when it comes to Afrin, which has an estimated population of more than 300,000 after having been swelled by refuges from other parts of war-torn Syria. Russian advisers were based in Afrin but were withdrawn by Moscow just days before Operation Olive Branch was launched. Erdogan claimed last week that he and Russian President Vladimir Putin have an agreement over the Turkish incursion. A Kurdish official told al-Sharq al-Awsat, a Saudi-owned pan-Arab newspaper, that the Kremlin brokered a meeting between the YPG and the Syrian government 48 hours before the Turkish offensive. He said the Kurds were told to hand over Afrin to President Assad as a way to avoid a Turkish attack and it was when they refused that the Russian military advisers were removed from Afrin. Russia has been wooing the Kurds but appears now to have chosen the Turks in the conflict with the Kurds. Russian analysts say Turkey is more important in Moscow’s plans for ending the Syria conflict in a way that benefits its ally Assad. “Afrin’s defenders have a poor hand to play,” according to Aron Lund, an analyst at the Century Foundation, a New York-based think tank. He says that while the Turks risk getting bogged down during the offensive and the YPG could drag out an insurgency, the Syrian Kurds face a powerful foe in Turkey “whose goal is not to win concessions but to destroy it.” Kurdish leaders may have no option but “to negotiate with Moscow and Damascus, self-interested actors whose assistance will come at a steep price, if at all,” he says.